Aged 26 Years, 8 Months and 26 Days. I took so many pictures of Pattie's Grave. I put together a slideshow for you, in the hope of doing the sculpture justice. 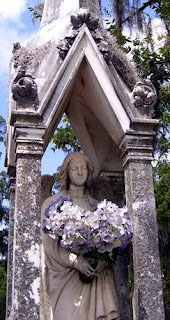 I wanted so badly to remove the flowers and photograph the angel without them, but I restrained myself. That is a beautiful monument. The extra information about her is very useful to family historians. I have not seen any with more information about the individual on the sides and back. Often you will find names of other family members. Thank you for the reminder to check all sides. Beautiful! Loved the video too. If you would like any information about her or our family (which is heavily documented)I'd be happy to help. Her husband remarried once more after she died, had two more children and died in NY in 1867 at the age of 36. Pattie was my great great grandfather's 1st wife. After Pattie died, Edwin Thomas Jones remarried Agnes Davidson Rust in 1862 and had two more children: Robert Lee Jones (1865-1947) and Edwin Rust Jones (1863-1928) I am descended from this second marriage with R.L. Jones being my great grandfather. Thank you for sharing this video and additional info!